The Berkeley Journal of Gender, Law & Justice has published a special symposium issue devoted to Presumed Incompetent: The Intersection of Race and Class for Women in Academia, the recent book edited by Professor Angela Harris with Professor Gabriella Gutiérrez y Muhs of Seattle University, Professor Yolanda Flores Niemann of the University of North Texas, and Professor Carmen G. González of Seattle University School of Law. The book, published in 2012 by Utah University Press, features personal narratives and qualitative empirical studies that expose the daunting challenges faced by academic women of color as they navigate the often hostile terrain of higher education. The special issue of the Berkeley Journal of Gender, Law & Justice is based upon a March 8, 2013 symposium that featured more than 40 speakers who were invited to celebrate and respond to the book. Among the contributing scholars is Dean Kevin R. Johnson, whose article "Important Lessons for University Leaders" (co-authored with Maria P. Lopez) appears in the issue. Angela Harris is one of the nation's foremost scholars in the fields of critical race theory, feminist legal theory, and civil rights. She joined the UC Davis faculty from UC Berkeley School of Law in 2011. Blog entry cross-posted from Justia's Verdict. Legal and political commentators have already spent thousands of hours on how best to understand Justice Alito's majority opinion in Burwell v. Hobby Lobby, and whether Justice Ginsburg's dissent was accurate in saying the decision was of "startling breadth." But to understand the scope of the majority opinion construing the federal Religious Freedom Restoration Act (RFRA), we may need to focus on the separate concurring opinion of Justice Kennedy, an opinion that seems to be getting little ink. Two important and complex questions need to be asked about this concurrence: (1) Why should we care what it says? and (2) What does it really say? In the space below, and in my next column in two weeks, respectively, I take up those each of those questions. When There Are Five Votes for a Majority Opinion, Do (or Should) Concurring Opinions Matter? The first question-why we should pay any attention to the content of Justice Kennedy's opinion-is fair to ask, and complicated to answer. After all, Justice Alito's opinion was an Opinion of the Court, which means an opinion for a majority of the voting Justices and not just for a "plurality" of them. In most circumstances, when there is an Opinion of the Court, lower courts (where battles over the scope of RFRA are going to be most meaningfully fought, at least until the Supreme Court decides another RFRA case) must look for meaning and guidance in that Opinion, without necessarily consulting the one or more additional concurring opinions that may have been filed. But, crucially, in Hobby Lobby, Justice Kennedy's was the fifth vote in a 5-4 case; without Justice Kennedy's joinder, Justice Alito's opinion would have lacked a majority. So to the extent that Justice Kennedy's separate opinion represents a narrowing gloss on Justice Alito's writing (and in Part Two of this series I will take up whether Justice Kennedy's opinion is indeed narrower), there is a plausible argument to be made that lower courts (and perhaps also future Supreme Courts) should view Justice Kennedy's opinion as the guiding or controlling one. Certainly that would have been true had Justice Kennedy not joined (some or all of) Justice Alito's opinion, but instead had concurred only in Justice Alito's bottom-line judgment that Hobby Lobby should win, and written a separate opinion laying out his narrower reasoning. In that instance, everyone would agree there would be no Opinion of the Court (for the parts Justice Kennedy did not join), and Justice Alito's opinion would be for a plurality only. And in situations like these, the Supreme Court has held, in a somewhat well-known 1977 case, Marks v. United States, that lower courts should look for and be guided by the "position taken by those Members [of the Court] who concurred in the judgments on the narrowest grounds" (emphasis added). Which Matters More, a Justice's Vote (to Join a Majority Opinion) or His (Concurring) Voice? Is the situation really so different if a Justice joins an Opinion of the Court (to make a fifth vote) but then writes separately to make clear the (narrow) understanding of the majority opinion on which he based his decision to join? There are first-rate legal minds (including, perhaps, some of my Justia ConLaw professor colleagues) who may say "yes"-formalities matter, and the act of being the fifth vote to join a majority opinion is all-important. There are no constitutional provisions, statutes, or judicial regulations that speak to this question; it seems to be a matter left to and determined by judicial practice. I am not aware that the Supreme Court itself has ever offered detailed views on how a situation like this should be handled, but I find it hard to see a big difference-in the context of a case whose result is determined by a 5-4 vote-between "concurring in the Judgment" and writing a separate opinion, on the one hand, and joining a majority opinion while writing the very same kind of separate opinion, on the other. Because the writing of a separate opinion laying out a narrower view than that which might have been laid out by the majority opinion is a more specific and more fully explained act than is the general decision to join the majority opinion, I think attaching weight to the narrowing, specific concurrence makes good sense, especially if the concurring Justice is still on the Court (such that his separate writing bears on any prediction of how the Court would rule if another case were brought to it today.) I say this in part because a decision to join with other Justices to make an Opinion of the Court may have been made in part to keep peace at the Court or to avoid the direct insult of a colleague, and does not mean that there might not be important substantive differences among all those who join the Opinion. The case for crediting the narrow understandings reflected in concurring opinions in this setting is especially strong when the majority opinion may itself be fuzzy (or silent) on the legal question at issue. In these circumstances, a fifth Justice who sincerely believes the majority opinion embraces the narrow reasoning that is on his mind does would not want to refuse to join (and concur only in the judgment) because of the fuzziness. Collegiality and harmony are better served by permitting him to join but to make clear (in a way that will be respected by lower courts) the expectations on which his joinder is based. If his separate concurrence is not given controlling weight in these circumstances, he will be encouraged in future instances not to join the majority opinion (but instead to concur in the judgment only), and this might create needless division and intra-Court friction if in fact the majority opinion embraced the (narrow) holding he thought it did but about which he was not completely sure. Even when the majority opinion (which has five votes) is clear on the legal proposition in question and a concurring Justice's "understanding" of the majority opinion, on which his joinder is premised, is objectively unreasonable, there is still a forceful argument to place weight, in a 5-4 case, on a separate concurrence by a Justice within the majority. To the extent that a concurring Justice makes clear by his writing that he disagrees with this part of the Opinion of the Court, his narrower understanding of the law should control, regardless of whether he joined the majority opinion or simply concurred in its judgment. In effect, we should read his actions/writing together to mean that he really didn't join with the part of the Court opinion with which he (apparently) disagrees, but he just decided (perhaps because he misread the majority opinion) not to formally opt out of any important sentences or paragraphs in the majority opinion that dealt with the legal proposition in question. It also bears mention that majority opinions often (usually?) fail to break up analysis of each legal question into a separate Section or Part. For this reason, Justices who agree with the bulk of an opinion's analysis, but who may disagree with a few key sentences, or even words, cannot easily register their nuanced mix of agreement/potential disagreement simply by declining to join whole subdivisions of the opinion. A few hypothetical variants may help make my point. As I suggested earlier, everyone seems to agree that if a fifth Justice joins most of an opinion, but expressly declines to join a Part or Section of the opinion that included legal proposition X, we would say the Court has not embraced X. If, instead, the fifth Justice writes to say that he "join[s] all parts of Opinion of the Court, except to the extent that the Opinion says X," again there would be no Opinion of the Court as to the legal proposition X. Now imagine the fifth Justice writes separately to say: "I join the Opinion of the Court because it does not say X." Should that explicit statement be treated any differently? And, finally, how about: "I join the Opinion of the Court on the understanding that it does not say X"? To me, it would be formalistic without justification to treat the last two of these situations (regardless of the reasonableness of the concurring Justice's reading of the majority opinion) differently from the first two. I do think the fact that a Justice joins a majority opinion should not be completely irrelevant in these kinds of situations. So, for example, if there is ambiguity in the meaning of the concurring Justice's separate writing, that ambiguity should be resolved in favor of harmonizing it with the majority opinion that she chose to join. But to the extent that the concurring opinion clearly disagrees with, or offers more details in narrowing, legal propositions asserted in the majority opinion, the concurring Justice's voice should control over her vote (to join the majority). Perhaps the best counterargument, that is, the best argument in favor of not attaching controlling weight to the concurring opinion, is that the Marks-style analysis is often difficult to undertake, and sometimes lower courts make mistakes in trying to figure out what the narrowest common grounds are between multiple opinions. Deciding what is "common" between opinions, and discerning the "narrowest grounds" can be challenging. In the Marks setting, we have no choice but to undertake this tricky analysis because without comparing multiple opinions (no one of which had five votes) we lack any holding at all to guide future cases. By contrast, in the situation I describe in this column, there is an Opinion of the Court (that got five votes), and so telling lower courts to follow it only, and not to complicate matters by trying to incorporate the concurrence into the analysis, does not deprive the system of a holding to guide lower courts. In the end, I find this counterargument unconvincing for three reasons. First, the Marks-style analysis may sometimes be difficult, but courts do perform this task regularly, and in some cases it may actually be easier to focus on clear limiting language in a concurring opinion than to resolve ambiguities within the majority opinion alone. (I should note that some appellate courts-including the U.S. Supreme Court during its early history-do not issue "Opinions of the Court," but rather issue individual opinions seriatim, leaving lower courts to figure out the rule(s) of law that were adopted.) Second, we employ Marks analysis not just because we want to generate a holding (we could to that by flipping a coin as between all the opinions that supported the judgment), but because it makes normative sense to seek to identify true common analytic ground between five or more Justices. If that is true in Marks, it is true here as well. Finally, as I noted earlier, if we don't attach controlling weight to a concurring opinion in the situation I posit here, then a Justice who makes the fifth vote in a future case will, instead of joining the Opinion of the Court, simply concur in the judgment and write a separate opinion anyway, and so we will be right back in the realm of Marks. If a Justice cares enough about an issue to write separately, she probably will do what it takes to make sure the concurring viewpoint is given as much weight as possible in future cases. I am not aware of a huge number of prominent instances in which a Justice provided a fifth vote for an Opinion of the Court and then also wrote separately to distance himself in a discernible way from at least some broad propositions in the majority's approach. But in well-known cases in this category that do come to mind, lower courts have tended to place controlling weight on the concurring views of a fifth Justice even though he also joined the majority. Maybe the most famous illustration of this is Youngstown Sheet and Tube v. Sawyer, where Justice Jackson's concurring opinion has held tremendous sway in lower court (and also later Supreme Court) rulings, even though he also joined Justice Black's Opinion of the Court in this 5-4 case. Another significant decision is the 5-4 ruling in United States v. Verdugo-Urquidez, where Justice Kennedy joined Chief Justice Rehnquist's majority opinion (giving it a fifth vote), but also wrote separately to express views that were narrower than those expressed in the Chief's writing. And a Third Circuit case, at least (with then-Judge Alito part of the unanimous panel), found that Justice Kennedy's views controlled. 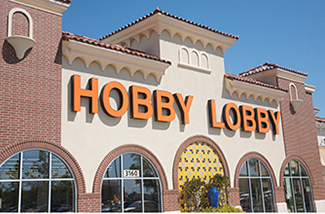 Perhaps the case most similar to Hobby Lobby in this respect is National League of Cities v. Usery. There, as in Hobby Lobby, powerful entities-States rather than corporations-sought exemptions from federal workplace regulations. And, similar to Hobby Lobby, a five-Justice majority opinion (authored in that case by Chief Justice Rehnquist) held that States were immune from the minimum wage regulations at issue there, laying out what on its face seemed like a rather broad principle of state immunity from federal regulation in areas of "integral" or "traditional" government functions. Justice Blackmun joined the majority opinion, but also wrote separately to make clear his narrow understanding of state immunity and what the majority opinion should stand for; in Justice Blackmun's view, state exemptions depended on the application of a balancing test in which federal interests were weighed against state autonomy. In the wake of National League of Cities, at least some influential lower courts found Justice Blackmun's balancing test to be required by the Court, even though it was not mentioned explicitly in Chief Justice Rehnquist's majority opinion. Indeed, even though there was an Opinion of the Court in National League (because Justice Blackmun did join the Chief's writing, giving it five votes), the U.S. Court of Appeals for the District of Columbia characterized the Chief's opinion as a "plurality" view, and focused instead on how best to read Justice Blackmun's separate writing. And when the Supreme Court itself was called upon to apply National League of Cities five years later in Hodel v. Virginia Surface Mining, it observed that National League of Cities stood for some kind of balancing test, citing Blackmun's concurring opinion. There may be (and probably are) counterexamples, but these high-profile cases, especially National League of Cities, suggest that there is at least a significant likelihood that lower courts will (justifiably) feel controlled by Justice Kennedy's Hobby Lobby writing and thus will parse it to see if his views narrow the scope of Justice Alito's opinion. So I will turn to that parsing in Part Two of this series. In my last column, I began analyzing SB 396, a laudable but legally questionable effort by the California legislature to repeal, by ordinary legislation, provisions of Proposition 187, a 1994 voter-enacted measure that imposed harsh restrictions on unlawful immigrants in the State, restrictions that have since been blocked indefinitely by a federal district court judge. As I explained, the main problem with the repeal effort is Article II, section 10(c) of California Constitution. This provision, designed to maintain the integrity of the initiative device, prevents the legislature from repealing any voter-enacted measure unless the repeal measure is itself "approved by the electors" (i.e., the voters). Because [Proposition 187 was] enacted by initiative, the question arises whether the Legislature may act to strike these provisions from the codes. The California Constitution provides that the Legislature may amend or repeal a statutory initiative 'by another statute that becomes effective only when approved by the electors. . . .' (Cal. Const., art II, § 10, subd.(c).) While it may be argued that this bill proposes an improper 'repeal,' the better view would appear to be reflected in an opinion by Legislative Counsel concluding that the Legislature is within its powers to delete statutes that have been abrogated by the courts. As Counsel notes, the evident intent of the subdivision (c) is to 'protect the people's initiative powers by precluding the Legislature from undoing what the people have done, without the electorate's consent.' . . . Accordingly a subsequent statute will 'amend' a statutory initiative within the meaning of subdivision (c) only if it changes the scope or effect of that initiative by adding or taking away from it. . . . Because the provisions that would be deleted by SB 396 have previously been held to be unenforceable, it seems reasonable to conclude that this bill would not make a substantive change in the law as prohibited by subdivision (c), and therefore would not unconstitutionally change the scope or effect of Proposition 187. In other words, a legislative measure that does not "change the scope or effect" of a previously enacted initiative cannot be said to amend or repeal the initiative, and does not require voter approval. While creative, this argument is not persuasive. Even assuming that the "scope or effect" standard is the right one to apply, SB 396 fails the test. For starters, as I pointed out at length in my earlier column, a law that is blocked by a court but that remains on the code books has significant potential effect down the road, insofar as circumstances could change to remove the judicial block. Courts can revisit their prior rulings, higher courts can change the legal landscape against which lower courts make decisions (as the Supreme Court in fact did in the immigration regulation setting in 2012 in Arizona v. United States), parties can seek to reopen cases, etc. All of these possibilities exist in the context of Proposition 187. Indeed, because the district judge who struck down parts of Proposition 187 did so in part because of congressional laws on the books, there is yet another possible change that could trigger revisiting the judicial block on enforcement-subsequent congressional action. For all these reasons, we cannot say that Proposition 187's operative provisions that remain on the books lack effect; at most, we can say that the present effects are blunted, and that the future effects are hard to gauge but potentially significant. But there is an even more fundamental flaw in the Legislative Counsel's position; the Legislative Counsel seems not to recognize that a law whose operative provisions are being blocked continues to have an expressive effect, insofar as a state's laws, as written, send a message to the world about the state's values. Indeed, it is that expressive effect-of having the mean-spirited language of Proposition 187 still on the books-to which SB 396 is itself a response; repealing the text is a good idea primarily because leaving the text intact continues to send a message. But the people who voted for Proposition 187 may have wanted to accomplish the harsh message that Proposition 187 conveys, irrespective of whether the operative provisions of the measure could be enforced. Even if 187's message is odious, there is nothing unconstitutional about a state having that message codified in its books, which is why the District Court Judge did not order that Proposition 187 be stricken from the code books, only that its provisions not be enforced. (Some kinds of messages, regarding race or religion, may themselves be unconstitutional, but messages about immigration benefits do not violate the federal Constitution in the same way.) Voters of a state have authority to convey even unkind and unwise messages in the initiatives they enact, and the California Constitution does not seem to give the legislature the power to override those messages. Indeed, the legislature cannot have it both ways, saying that the message sent by Proposition 187's continued presence on the books creates problems, but then denying that the message has any "effect." Perhaps an example from a different constitutional area will help drive the point home. Imagine the California voters were to pass an initiative that says: "Catholic doctrine is religious truth, and that all other religions are false." The measure, by its terms, does not go on to tell anybody to do or refrain from doing anything-it is a purely expressive initiative. Putting aside whether such a measure violates the Establishment Clause of the Constitution and what a court might do about that, no one could plausibly argue that that the legislature could repeal and remove this measure from the code books without popular approval the day after it was enacted on the ground that the initiative, and thus its legislative repeal, is purely expressive and has no scope or effect in the real world. The codified text of a statute (or state constitution) matters, and legislatures are given authority to amend that text, but only if they go through the required legislative procedures. As I argued in my last column, the requirement of popular approval may be analogized to the requirement of bicameralism; just as one house of the state legislature may not repeal text-whether or not the repeal changes the present-day operative effect of that text-without the other house, neither may the two houses accomplish repeal of initiatives or state constitutional provisions without involving the people. We can see this even more clearly using yet another hypothetical, this one an attempt by the California Legislature to change the language of the state constitution rather than a statute adopted by the voters. As with initiative statutes, the California lawmakers can, under the terms of the California Constitution, propose changes in constitutional text, but such changes require voter approval to go into effect. Suppose the California Supreme Court (the ultimate interpreter of State law) were to rule that search and seizure protections under the California Constitution do not extend to automobiles. The legislature could not, without getting the required popular consent for all constitutional amendments, tweak the text of the California Constitution to add words making explicit that car searches aren't covered, simply because (under the prevailing judicial decisions at the time) this amendment wouldn't change the real-world "scope or effect" of the provision in question. None of this is to say the legislature should abandon the efforts to repeal Proposition 187. Instead, it is to say simply that the legislature should act to repeal the Proposition, but that the repeal should take effect only when the voters approve it. And having the voters remove the hateful Proposition 187 themselves is the best solution for expressive reasons anyway. If State Senator Kevin De Leon is correct, as I believe he is, that erasing the language of Proposition 187 would be powerfully symbolic, think of how much more powerful it would be if the very electorate that passed Proposition 187 now wants to make clear that this measure no longer represents the views or values of the State. And I think popular approval would be easily forthcoming. The State and its attitudes about immigration and ethnicity have evolved a great deal in the past two decades. Since the measure could be put to the voters without having to assemble signatures, no signature-gathering money would need to be expended. Indeed, because I can't imagine any organized opposition to a measure proposing repeal, I don't see the need for any expensive campaign to obtain enactment. Having the voters undo their own misguided handiwork would be poetic, practical and (legally) proper. And, importantly, it would avoid opening up the legislature to the charge that it is riding roughshod over the will of the people and the initiative process.